CamScanner can be used to scan Receipt, Bill, Tax Roll, Business Card, Membership Card, VIP card, Agreement, PPT and Whiteboard, Note, Memo, Script, Letter, Books, Magazines, Newspaper, Poster, Coupon, Courier Sheet, Resumes and any other documents. 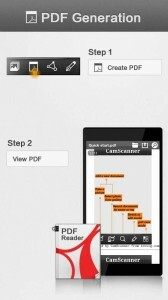 Batch Scan Documents : It allows you to take pictures of multi-page documents and you can scan up to 3 images per batch. Auto Crop and Auto Enhance Image : It has smart image processing technology which can auto detect edges of images, auto enhance image and auto crop it. The option of color enhancement is also provided. 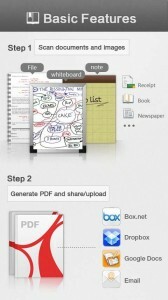 Create & Share Multi Size PDF files : You can create PDF files in more than 10 different sizes and formats including A4, B5, user custom and auto fit to the proper size. Backup Documents: It can back up and restore your documents in your SD card. Manage Scanned Files : Managing your scanned documents is easy in file list or thumbnail view, tag, merge and delete files or pages. 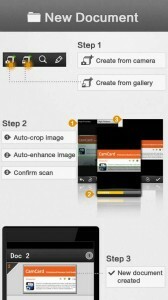 With so many features and free to download app, you would love to use this app.